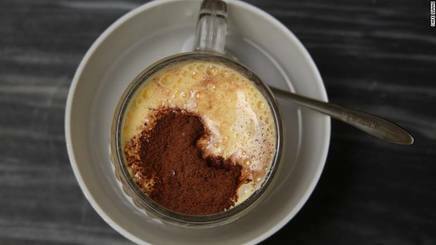 "Cà phê trúng," or egg coffee, a Hanoi specialty in which a creamy soft, meringue-like egg white foam is perched on dense Vietnamese coffee. There are hot and cold versions. The former is served as a a yellow concoction in a small glass. It's consumed with a spoon and tastes almost like a coffee flavored ice cream -- more like a dessert than coffee. The hot version comes resting in a small dish of hot water to maintain its temperature. The strong coffee taste at the bottom of the cup seeps through the egg -- the yellow layer on top -- and is quite thick and sweet, though not sickly.